Darlings, to the left savor the sassy style that is the FRYE Deborah Studded Bootie; on the right alloy your pretty peepers to dance over the decadence of MIA’s Jayne Western Boot. While the magnificent MIA is a slightly darker shade and proffers a heel that is un petit lower than that of the original; for just $104.47, as opposed to the $497.95 asking price of the FRYE’s, they are every bit as fabulous for the fashionista seeking to add a smattering of cowgirl chic to her shoe collection – at a price that no frugalista could possibly resist! Tell me, kittens…will you be a big spender and go for FRYE, or be thrifty and spring for MIA? I don't know. Neither of them appeal to me. I want something with a heel. Happy Tuesday, E.
I need these! I absolutely love the low heel and the lower top. They would go perfect with a skirt and still show off my calves. Love MIA! I like the Frye ones, they're a bit more rustic looking. While I do like the distressed leather look of the Frye boots, I'd go with the MIA. It's also a bit sleeker looking and for the price, why not?! Great finds as usual, E!! I have to admit that I've never been a huge fan of the cowboy boots. I'd much rather have a pair of stilettos any day, but that's just me! The color of the MIA are pretty, but you can never go wrong with Frye boots :) Great alternative find, though! they're not really my type but if i hv to choose i go with MIA cuz it lookz better anyway!!! It depends on how often I'd wear them. If it's a passing fancy, definitely the MIA, but for tried and true, would stick with Frye's. Good find! These are so cute but no one can replace Frye in my heart. Go Mia!!!! That's all I have to say. The cowboy look isn't really my style, but if I were a fan, I'd probably spring for the Frye. I rarely skimp on shoes unless it's a fad, but sturdy boots are something a gal would probably want to invest in! im not a big fan of western boots.. but great steal version ! haha I love tightwad tuesday! Here's the thing with Frye, the leather, the fit, everything just gets better with age. So if you have the spare cash I'd always go for frye because they're an advestment that will pay off! If I had the money I would go with Frye on this one! I think I like the coloring better. I would die for those Fryes! So fab. The MIA is an awesome alternative...great pick! I've always had good luck with MIA. I think you'd get a good wear out of these from MIA. They always fit well and are comfortable. Such a great affordable find. 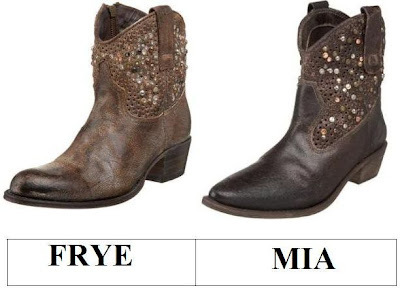 The MIA pair looks just as fabulous as the ones by FRYE...I'm a frugalista on this one! I've never been much into cowgirl chic but I do love the MIA ones, I think they'd look amazing with a floral-print dress or something. So I'll go with those ones :D Hope you've been having a happy Tuesday! I love ankle booties, I wear them about every day! Oh, I do like MIA. Although, I don't know if I'm the cowgirl type. I like the lighter ones better. I actually have a chestnut colored pair of boots similar to these and I love them! I am gonna go superfrugalista on you and keep my $$ in my wallet. I don't do "cowgirl" and I don't do "low heel" - typically. Great find -but not for this "city slicker"
i like the Mia boots. i would rock those. definitely frye!! I like the color so much better! I prefer the color of Frye's, but honestly, I probably wouldn't spend that much on either. I've always had a place in my heart for cowboy boots. I love the FRYE ones. The distressed looks much better. These look sooo similar - awesome comparison! !